In general I haven't been a huge fan of Stop & Shop. Their stores are really boring and the selection and pricing often aren't particularly special. However, I decided to stop by this large store in Union near the border of Irvington not too long ago, and I have to say I was very impressed. This store is built on a hill and has a relatively small parking lot, so one of the features is an underground parking garage with an elevator that leads into the store. These strange-looking structures regulate the height of vehicles entering the parking lot to keep tall vehicles from the garage. 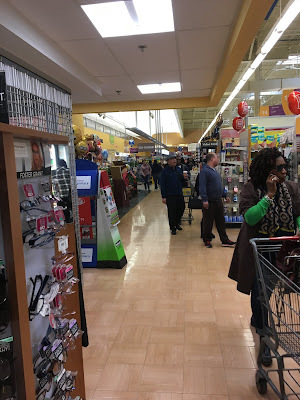 For a little history here, it was right near here that the original ShopRite store was located (that is, the first Wakefern member store to adopt the name Shop-Rite), the Uniondale Shop-Rite on Stuyvesant Ave. I think it may have even been on this property. Later, this store was constructed by Stop & Shop around 2000. The store still features an older decor package, but it's looking great. The supermarket features one entrance on either side, this one leading to pharmacy, frozen, and dairy; on the far side, you walk into produce, bakery, and deli. Closeup of managers' offices above the pharmacy entrance/exit. We're going to head into the far side entrance for produce first. Notice that the two sides are not exactly symmetrical, since this side does not have offices over the entrance/exit foyer. OK, I didn't say the store was exciting. But it is very nice and generally well-maintained (except for that burnt-out light on the right!). Looking back up towards the entrance. It feels like there should be a café in that corner to the right, between the entrance and the bakery, but there's just seasonal merchandise. Maybe at one point there was. 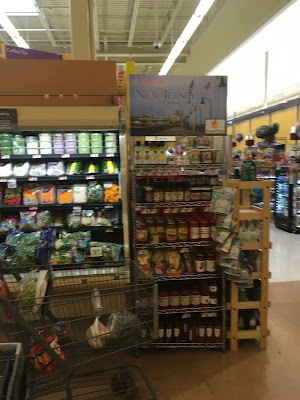 This was pretty cool, at the front of the produce aisle: "A taste of New Jersey" -- locally-produced products. It's a nice touch for a foreign-owned, big chain supermarket. Looking from the front corner along the front-end. It's a large produce department, but the quality was not up to the standards of ShopRite, Food Bazaar, or SuperFresh. A look at the bakery department in the front corner, with the unquestionably stupid name "Oven & More". What more? Here we can see "Taste & Time", the deli, with the bakery in the front. The salad bar and cheese area is visible in the foreground here. Looking back up towards the front of the store. The produce area is very large, but not much of it is actually produce, such as the salad/cheese island to the right here. It's not a problem, but the produce aisle looks much larger than it really is. Nice selection of cheese and fresh pasta. Unfortunately, it's very obvious that this used to be a service department and it no longer is. You can see very clearly where the service counter would have been, now replaced by self service cases. I don't know when the service seafood department was closed, or why. It doesn't seem like this store does a big business in perishables, but once you get out of the grand aisle, the store gets much better. Meat continues along the back wall, with a service butcher on the far side of the back wall. Looking back towards the former seafood department. One more complaint (sorry), but the walls are too blank around here! By the service butcher, which is located under a lower drop ceiling, there is a more exciting sign. Let's take a minute to look down some of the grocery aisles. 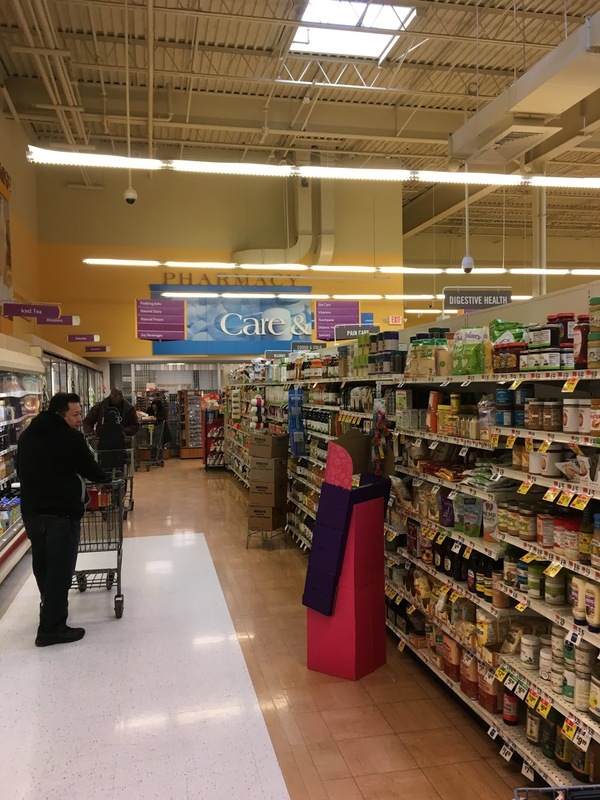 Stop & Shop is getting much better at dry goods, with better selections and lower prices -- sometimes even lower than ShopRite. Looking along the back wall of the store. Notice that the aisle markers come from the next-newer decor package. The ceiling is very high and the skylights let in a lot of light. Although the first aisle feels somewhat dingy, the rest of the store is very bright and open. Clean and spacious aisles, with a surprisingly large international selection. Although I still wince at the labeling of Latin foods as Spanish. New Jersey doesn't have a large Spanish population, although there is a large Latino population. Get it right. Aisle seven is jam-packed with great foods. Of course, you'd never know it. A look at the sign over the butcher shop. These signs, which I believe are original to the store, are really nice. The yellow-ish/beige walls are better than the later beige/white walls, which are too bland. Although it's hard to tell in these photos, the store was packed. Lots of people buying large shopping orders. Acme Style would sometimes post pictures of stores that looked deserted and insist that the store was jammed with people, which I never believed until I started blogging myself and found that, as a matter of fact, it can be hard to show that a store is very crowded! Looking along the back wall towards deli from the far side. Frozen is on this end of the store. If I remember correctly, there are one and a half frozen aisles. The half aisle shares space with nonfoods. Notice that this aisle, along with a few others, has received updated category markers that go along with the latest decor package. Dairy in the back corner of the store. Dairy shares the last aisle with natural and organic foods, which Stop & Shop still separates. Natural frozen is also located at the front of the last aisle. It still doesn't make any sense to me that it's separated. Another nice sign, although we find ourselves asking, how many natures are promising? You can see here that not all of the category markers have been switched either. 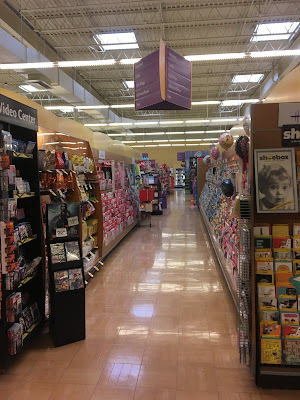 Pharmacy and floral are at the front of this aisle. An overview of the corner. A clearer view of pharmacy (before it closed for the afternoon!) from the floral department, which is also gramatically-challenged. You can see the second entrance to the right here. An overview of the front corner. Looking from floral along the spacious front-end. There is also a PNC Bank branch along the front end next to the customer service counter. Overview of the front end. The ceiling here is similar to that over produce, but it's less dingy here. Managers' offices and other employee rooms line the front wall on the second floor. Notice that some checkout lights have been replaced, but others have not. Customer service along the front wall. Don't ask me why I took so many front-end photos here! Usually I only get one or two. This sign made me laugh. Do customers really have that hard a time figuring out where to leave from? Anyway, you have to already be walking in this direction to read it! I was very impressed with this store. It's a spacious, clean, and well-stocked store with a pretty good selection and generally reasonable pricing. I think it's important to note that all my complaints are pretty picky and minor, and overall this Stop & Shop is a great resource.